Angry kya? The source of all your anger is within you! The CEO of a mid-size firm confessed to me that he has anger management issues. He said he gets ‘ticked off on the flimsiest pretext’ and wanted to know how he could ‘control his anger’. This CEO reminded me of myself. I used to be this way. In fact, even now, at times, I do get angry. But, until a few years ago, my anger was mindless and would last several days. But now, my awareness, cultivated to through the practice of mouna (observing silence periods daily) helps me see the anger rising in me and encourages me to allow it to subside – because I now know that I can’t solve any problem or change any situation that I dislike by merely being mindlessly angry with it! Let me explain how I have understood to deal with anger. That statement was a Eureka moment for me! Perhaps I was aided by my reflective practice of mouna, maybe I was driven to enlightenment by my frustration with myself, whatever it was, it certainly helped me see the futility of my mindless rage. Clearly. Over the following weeks, I meditated more on this understanding. I realized that whenever you get angry with someone, you have caused that anger within you first. The target of your anger is outside of you – but the anger has risen within you. There is no point working on the target. You must work on the source. I employed this learning sincerely over the months that followed. In fact, after some years of diligent practice, I still believe this awareness is something you must sustain continuously. You must work on being aware in each moment. So, every time I get angry with someone or something, I remind myself that just getting angry mindlessly is a waste. 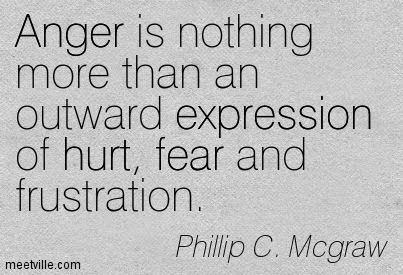 Trying to control anger doesn’t work either. Because when you control anger, you are repressing it – which is why you are often not even “seeing” that you are angry, whenever you are angry! You are resisting a natural human response. And whatever you resist, persists. Instead, go to the root cause of your anger. And always, every single time, you will find that your anger is born out of what you expect, out of what you desire. And when you see your desire clearly, ask yourself if you are capable of changing a current reality into an aspirational reality? If you think you can do this, then channelize the energy from your anger to achieve that aspirational state. Employ your anger for a Higher Purpose. (That’s what Gandhi did with the Indian Freedom Movement.) If you can’t, simply let go of your anger. Anger is like any other emotion – it will rise like a wave in you, as a natural human response to a situation. If you are aware of it you can either use the energy for a constructive outcome or you can let it go. If you are not aware of it, in extreme cases, it can even consume you. But more often than not it makes you feel helpless and miserable! Why would you want to cause your own suffering? A good starting point to deal with anger is to work on yourself – so begin with letting go of all expectations. Do your best, each time, and don’t set any conditions on the outcome of your efforts. Let whatever will happen, happen. In fact, whether you like it or not, whatever is due to happen will only happen. 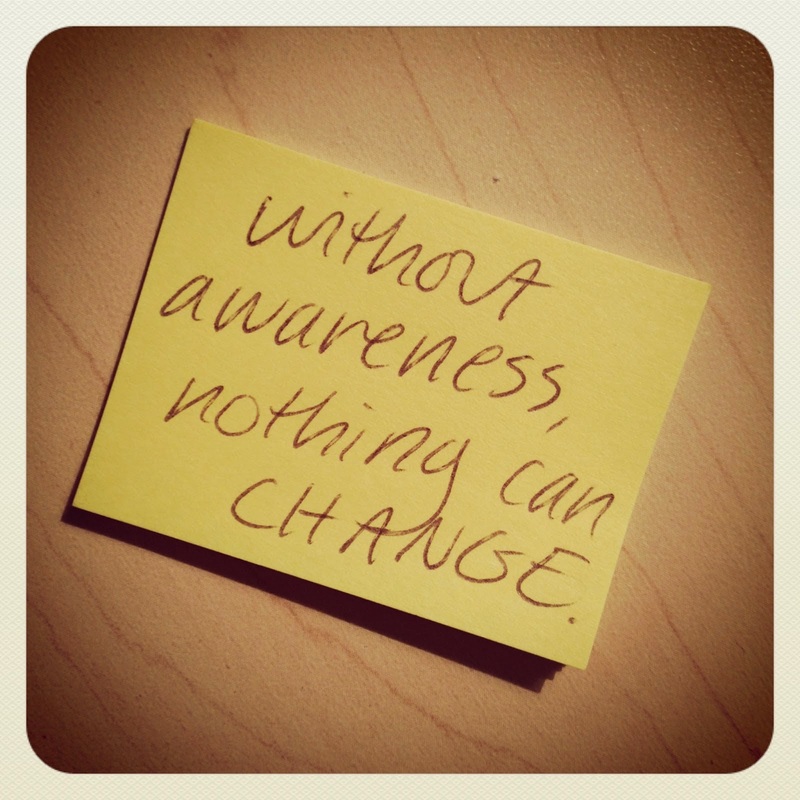 So, have an open mind, this awareness, all the time. That way, when anger arises within you, as it naturally will when what you don’t like, want or expect happens to you, you will see how pointless it is to get mindlessly angry. See if your anger can be employed to achieve a Higher Purpose. If you see that it can’t be, simply let it go. This is the only way to avoid being mindlessly angry! 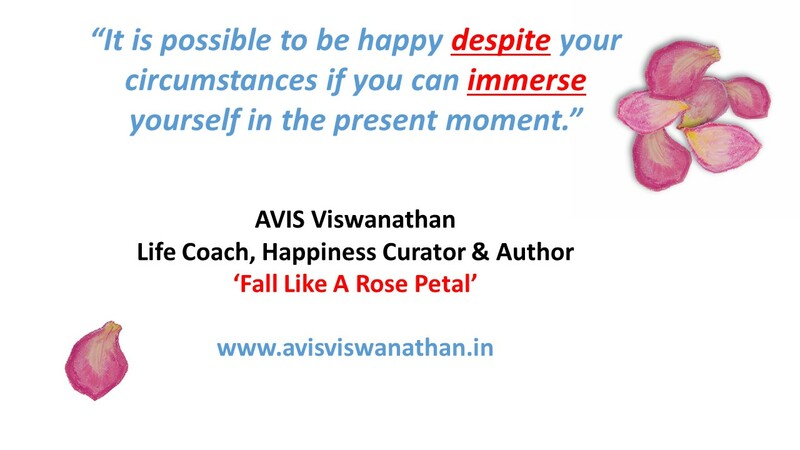 Author AVIS ViswanathanPosted on October 25, 2016 Categories Anger, Awareness, Expectations, Mindfulness, Mouna, Patience, Silence Periods, Suffering, UncategorizedTags Anger, Art of Living, AVIS Viswanathan, Expectations, Expectations bring Agony, Fall Like A Rose Petal, Happiness Curator, Inner Peace, Intelligent Living, Life Coach, Mahatma Gandhi, Mindfulness, Mouna, Patience, Purpose, Silence Periods, Suffering, VaaniLeave a comment on Angry kya? The source of all your anger is within you! Is it really possible to be happy despiteyour circumstances? A reader, commenting on my blogpost from a couple of days ago, said: “”Being in the present” and “living within” are the attributes of a finely-tuned mind that has broken the shackles of the mundane day-to-day existence.” He was of the view that this was not easy to achieve and that it involves a lot of hard work. Indeed. I am reminded of what a factory hand in Pune, who was attending a workshop on “Taking the elevator to Happiness” that I was leading some years ago, had to say: “Bhaashan se Raashan nahin bharta, Sahib!”(“Sir, ‘philosophical’ speeches can’t help us buy groceries/rations to run the household.”) True that. Understanding Life better cannot solve your problems. You still have to work hard, and consistently, on them. But what a better understanding can do is help you deal with Life’s upheavals better. More important, it can help you deal with them peacefully, happily! Surely, there is no set way to live Life – so no way can be called right or wrong. Living Life completely – facing, accepting and dealing with what you are given – is the way! 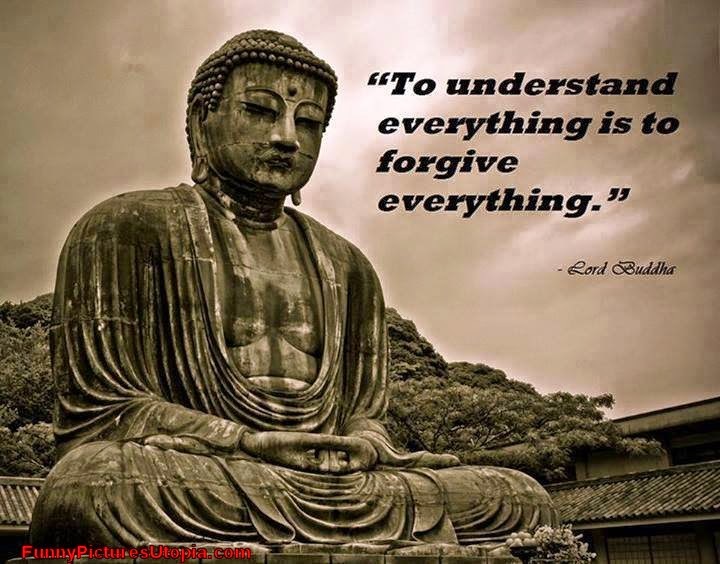 This is what I have learned from Zen teachings. Zen is not a philosophy. Because philosophy still operates at a mind level. And Zen goes beyond the mind. Zen draws you out of the mind, further, higher. So, when confronted with Life’s inscrutable challenges, you are invited to experience them fully, while learning to transcend them over a period of time – by training the mind – to be able to reach a ‘witness’ stage, to be merely an observer of your own Life. This does not mean inaction. This is a lot of action, a lot of hard work. Obviously, when you try to address a challenge you are facing, you work on finding a solution. If the solution works, great. When the solution doesn’t work, what do you do? You get angry, frustrated, sad, fearful – Zen teaches you to get past these debilitating emotions and experience the true nature of your creation. It helps you understand that everything – including your own Life – is transient, impermanent. Zen is awareness. Of just the present moment. Being aware does not mean a past hurt, guilt or memory will not rise in the mind. It does not also mean that a worry, of something that is likely to happen in the future, will not arise in the mind. The nature of the mind is that it can only live in the past or the future. The mind knows no present. And Zen teaches you to transcend the mind, go past its treacherous ways, and anchor yourself in the present. In the now. This is what happens to us when we are in nature’s lap. Each of us must have experienced that rare moment of completely losing ourselves to an ocean’s vastness or a mountains majestic beauty. Or sometimes losing ourselves to an art form that we cherish – like painting, cooking, music or writing. In those rare moments, you have lost your identity as so-and-so, with such-and-such problems, and have united with the Universal energy. Zen teaches you that this is possible in everyday Life too! 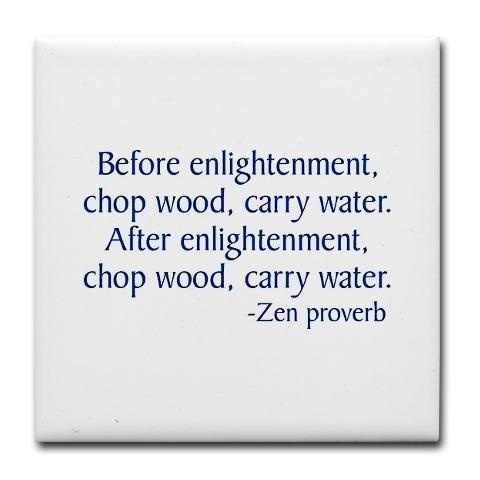 Which is why, when a Zen Master was asked, “What is Zen?” he replied: “Chopping Wood, Carrying Water”. These were everyday chores, even for a Master, in those days. And the import is that you have to be “immersed” in whatever you are doing in that moment without letting your mind wander into the past or the future. So, irrespective of what you are doing – or going through – be in it fully. My experience is that you can be in the throes of a challenge and still be happy if you choose to be. Owing to our bankruptcy, and an inexplicable set of professional challenges, we have a lot of debt on us as a family, and absolute cashless-ness at most times. It is not that I don’t feel responsible or that I don’t recognize the enormity of the task ahead – of rebuilding our business and repaying our creditors – of us. It is not that fear and insecurity – or even the guilt of having caused this financial mess – do not arise in my mind. But my awareness helps me gets past those thoughts, and helps me take actions that I must take every single moment, each day. When my actions don’t bear fruit – as they haven’t over several years – my awareness again helps me stay anchored and get past the grief that failure often brings with it. I sleep well each night and wake up the next day to do another round of ‘chopping wood and carrying water’. I am not sure I am “successful” with Life, but surely, I am peaceful living it! This may not be the only way to live. This may not even be the best way – may well be contestable, arguable and even admonishable. But it has helped me__and Vaani__stay anchored and peaceful through tumultuous times. Important, we have learned to ‘chop wood, carry water, immerse ourselves in each moment and be happy’! It is considered natural to rise in defense or take offense when someone offends you. But another response is possible: Give forgiveness, love and understanding to people that offend you. Does this sound difficult? Well, it really is not. Consider this: in the first place, you are offended because you allowedyourself to be offended. In that state when the offensive emotion has penetrated the deep recesses of your mind, agitation begins to brew. When you are agitated, you cannot think with clarity. Forgiveness, love and understanding, therefore seem impossible and impractical at this time. But what if you refuse to get offended? Sure enough, there’s a way. Try these three easy steps: 1. Don’t respond mindlessly, belligerently. Be aware of the so-called offensive remarks coming your way. And like a turtle would withdraw into its shell so that it remains secure, withdraw all defense mechanisms. 2. Respect the right of the other person to have an opinion, any opinion, that is different from you. 3. Smile. Accept the reality. Kill the urge to think ‘how-dare-you?’ and respond instead with an ‘aha!’feeling in you. Wish the person who’s trying to offend you all success. Convert the problem situation into a game. Play it! What if the offender was on Reality TV with you and the game was ‘Who-Barks-Least-Wins?’ And the prize money was worth millions. Play the game in that spirit. Like in any sport, practice makes perfect. So it is in this. Very soon, after a few attempts, you will reach a stage where you will be a World Champ and the peace, joy and bliss, that will follow will be worth more than all the money there is in the world! Author AVIS ViswanathanPosted on February 8, 2015 March 14, 2016 Categories Art of Living, Awareness, http://schemas.google.com/blogger/2008/kind#post, Inner Peace, Intelligent Living, Love, Reality TV, Understanding, World ChampLeave a comment on Understand. Forgive. Love. Frustration fulfills a need to express what you feel momentarily. But prolonged frustration makes you angry and depressive. The only way to beat frustration is to be aware of it when you feel so. Each of us is entitled to a bad hair day, a lousy mood and explosive expressions. Nothing wrong with it. 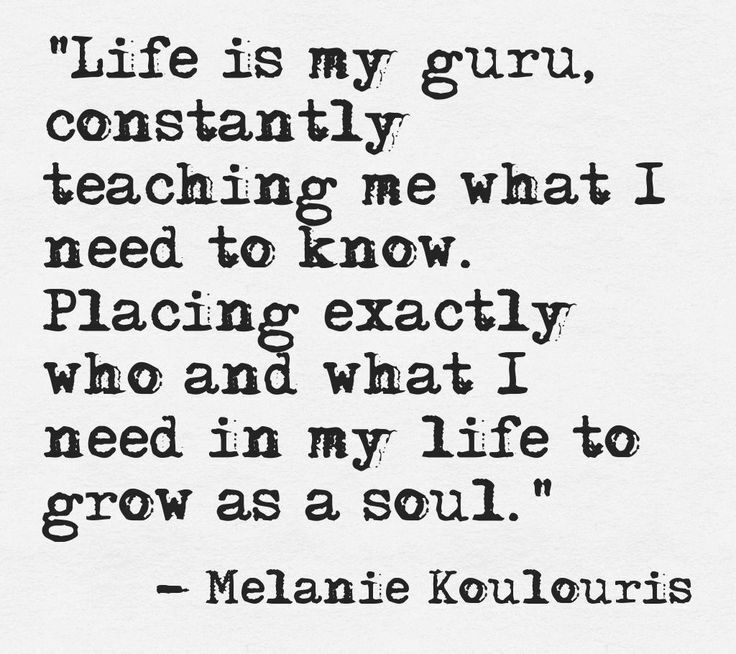 It is part of living, growing up, learning and evolving. In an instant gratification environment, a piece of technology that plays truant can cause frustration. An inconsiderate fellow-passenger can land you in a bad mood. A spouse or child can lead you on to a depressive spiral. And you may choose to express your frustration: gritting your teeth, thumping the desk, yelling, kicking a piece of furniture or breaking something. Up to this stage it is fine, but when you reflect back, you will often find that your frustration does not linger on because of what caused your explosive behavior but because you chose to express yourself in such dramatic ways. And for several hours, maybe even days, weeks and months, after that bout of frustration, you continue to sulk, grieve and brood over your ‘plight’. In this time the cause of your frustration may no longer exist or may have chosen to move on! But you are still languishing in the abyss of your negative mood or the anger that followed it. For just a momentary indiscretion, do you want to embrace prolonged agony? Think. How long would you hold on to a matchstick after you strike/light it? If you hold on too long, you risk burning yourself. So it is with frustrations. Be aware. The moment you feel frustration building within you, shift your attention. You see yourself in a long-winding queue, look for the most beautiful sight (may be even a person!) in your vicinity. You receive a disturbing e-mail, get on to facebook for a moment and see what’s going on! You and your spouse have had a lousy argument, go out, stand in the open and look up at the sky! Beat the first frustrating thought that arises within, by shifting focus. If you can play a game on your phone or computer, where you have to shoot to win, you can and will win this frustration-beating game! Frustration almost always breeds anger – which is a killer! So, be aware and beware! The Buddha says this so beautifully, “You will never be punished for your anger; you will always be punished by your anger”! When you feel frustrated about something or someone, stop wanting to control the situation or person, and simply let it – the frustration, the situation or the person – go! I spent much of yesterday battling with my laptop. My laptop was gifted to me by someone last year. For some vague reason, in today’s age and time, it has only an Intel Pentium processor. For that reason, it is an awfully slow machine. I also have a Norton anti-virus software installed on my laptop which further inhibits its speed. Yesterday, I discovered that the Norton anti-virus program had crashed and when I tried to trouble-shoot and fix it, it made my machine even more slow. Now, I am not a tech geek. I just know how to use my machine and that’s it. So, while I battled with my laptop and agonized over every click of the mouse, my frustration mounted. I realized that I was letting my frustrations get the better of me, when I took it out on someone who rang the door-bell mistakenly. Soon, I was also hopping mad at the maid and beginning to sound irritable with a business associate who had called up proposing something impractical. That’s when I decided to let it all go! I said to myself that if this is the way my machine is going to be, so be it. If this is the way the Norton anti-virus program is going to behave, so be it. If this is the way people – my maid, the person who rang the door-bell and the unreasonable business associate – are going to be, let them be. I shut down my machine and went for a long walk with my wife. I was healed at the end of that walk. I then returned to my desk and observed 20 minutes of silence. I forgave myself for letting my frustrations control me. I simply surrendered to the situation. I decided to live with the machine that I have – than lament about its idiosyncrasies or its slow speed or pine for a better, faster laptop. I am sharing my experience – and learning – here just so that you too realize that it is perfectly normal for frustrations to happen in everyday Life. But to allow them to govern and control your moods is to push yourself into a depressive spiral. You feel frustrated only when you dislike whatever is happening to you. A frustration is a clear sign that you are resisting Life. You can’t avoid frustrations from arising though – a flat tyre, a computer that hangs, a phone that loses its display, an unreasonable fellow passenger on a plane, a delayed paycheck – anything, or anyone, can cause you to feel frustrated. But if you refuse to get dragged by that frustration into depression and instead are aware that your frustration is an early warning sign of your resisting Life, then you can overcome the situation and heal yourself. On the other hand, if you let the frustration take over and control you for more than a day, chances are you will let anger consume you soon, and before you know it, you will be depressed. Funnily enough, if you watch your thoughts and behavior patterns when you are frustrated, you will realize that you often end up feeling frustrated about everything around you – and not just with the one thing or person that ticked you off in the first place. So, at the first sign of a frustration arise, pause, take a deep breath and let it go. 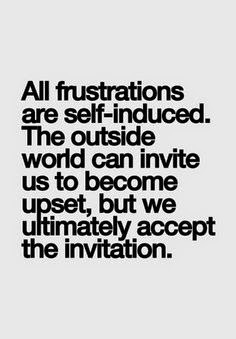 Let go of the situation or the person who is frustrating you. Awaken to the realization that your being frustrated with a situation is not going to make it any better. On the contrary, it is surely going to make you feel worse!